Is QE Lane better than QE Square? Let it go, Joe, they suggest. It's in the hands of the Environment Court now whether Auckland's downtown QE Square should be stopped as road, rezoned for development, and sold to Precinct Properties. It is getting down to the wire on this now, but issues keep coming up. To begin with many supporters of this campaign to retain public open space focussed on the loss of public open space. They could also see how combined with Lower Queen Street it could form a great civic square for Auckland, and bring it back to what it was two decades ago. The next issue that began focussing minds opposed to the sale was the width of the laneway proposed running East/West. Urban Design and Landscape Architects I talked with estimated it should be around 8 to 9 metres wide - not just for safety, but for amenity and feel. But Precinct experts wanted a more concentrated retail environment. To me this view was contradicted by overseas experts and experience. However, the legal challenge mounted by Auckland Architectural Association (AAA) needed focus and while the laneway width was a concern, the major concern was the loss of public open space. So the laneway width faded to the background in the legal action challenging Auckland Council's statutory processes. Which brings me to the Road Stop proposal put up by Auckland Transport at the request of Auckland Council. QE Square (like Lower Queen Street) was vested as "road" in Auckland City Council by Auckland Harbour Board in the late 1960's. It was also zoned "pedestrian mall" in 1976 by Auckland City Council. (Did you know: Parts of Aotea Square and St Patricks Square are also vested as "road".) Vesting public open space as "road" was a common approach by Councils back in the day. So QE Square being "road" is not unusual. Interestingly, the definition of road in the Local Government Act: "every square or place intended for use of the public generally..."
5. If objections are received as aforesaid, the council shall, after the expiration of the period within which an objection must be lodged, unless it decides to allow the objections, send the objections together with the plans aforesaid, and a full description of the proposed alterations to the Environment Court. The central issue is the need for the road for public use (as opposed to the need for the stopping). You can see how arcane some of the discussion can become because of the use of the word "road", when what was being discussed was a civic square. Seems that cases like this are extremely rare in New Zealand. Road stop proposals normally apply to paper roads and similar minor matters. And not Auckland's first civic square. Which brings me to a critical issue that has emerged as the hearing progressed. This relates to the use of QE Square by pedestrians, and whether that use (need) and amenity will be better when QES is no more, and its pedestrian function is replaced by (substituted by) a 100 metre long 5.5 metre wide laneway. Garth Falconer (Auckland Council's urban design expert) noted during cross examination, that in his opinion Auckland City needs more data and information about pedestrian movements in the CBD. In fact the study he prepared in 2014 for Auckland Council did contain data about pedestrian movements. This is the front cover of the Garth Falconer Reset Study that was presented to Auckland Council's Development Ctte on Sept 2014. It was one of the documents used to support the decision to sell QE Square. At page 13 is a map of data collected and reported relating to pedestrian movements. It also records Mr Falconer's concern that there was not much data recordiing pedestrian movements. This section contains the legend for the pedestrian movement map. 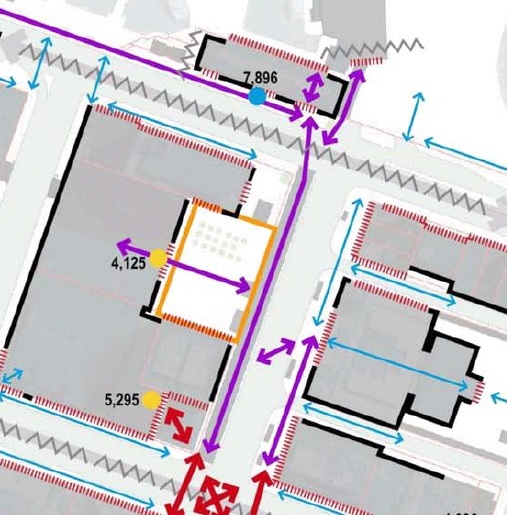 It describes the movements across QE Square AND along Lower Queen Street both as "Medium" - between 11,000 and 15,000 movements a day on average. Significantly, the map shows as yellow dots the Downtown Shopping Centre (DSC) "Door Count" figures. 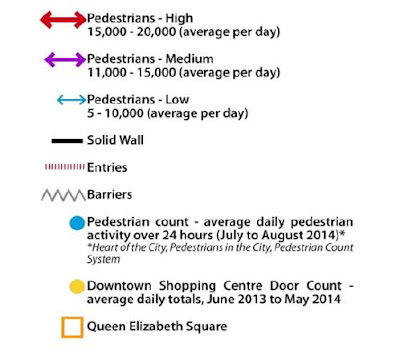 Thus, the figure 4,125 records the "door count" for the downtown shopping centre door off QE Square. (But this is half the story, see below). The first major point to note here is that the data presented by Garth Falconer contradicts the statement that QE Square is rarely used. In fact it is heavily used by pedestrians. And they won't all be walking along the arrow. They'll be coming from the ferry - many of them - either to go shopping, or to cut through the DSC. And when these measurements were obtained the Lower Queen Street bus station was still in use and pedestrian traffic across Lower Queen Street wasn't easy. People will also be walking across QE Square to (and from) the Zurich Tower entrance, and to (and from) the Zurich Tower cafe. And this is where I made a discovery. De Lambert's evidence for Precinct also looked at the use of QE Square. Her measures were NOT for a whole day - whereas Falconer's data reports pedestrian movements for a whole day. But what is especially interesting about De Lambert's evidence is her reporting of the door count data for the DSC. In her evidence (4.2) it is noted "It should be noted that pedestrians are only 'counted' on entering the building....". Thus if about the same number go in as go out the QE Square doorway figure of 4,125 would double to give about 8,000 ped movements across QE Square on average/day due to entry and exit from the DSC. This would account for the lion's share of pedestrian count across QE Square. 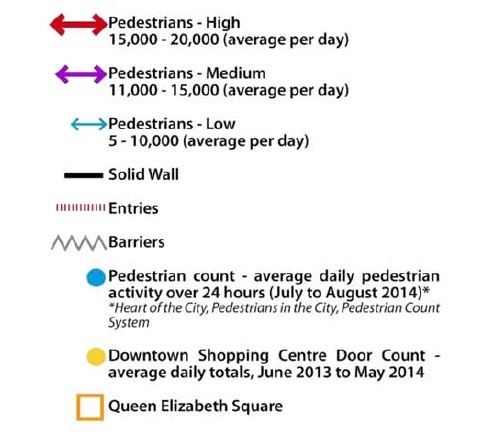 (De Lambert's evidence also states: Colliers daily foot count data also reveals that the Downtown Shopping Centre Queen Street entrance is the most used entrance, totalling 2,660,530 pedestrian entries for the period between 1 April 2015 to 30 April 2016, followed by the QE Square entrance totalling at 1,779,524 over that same period. 4.5 I have also obtained, from Colliers, data representing the total door count numbers from pedestrian entrances into the Downtown Shopping Centre from the period between April 2015 and March 2016 (refer Appendix 7). Which brings me back to "the need for QE Square as a road...". QE Square is a pedestrian mall. It is a public place where pedestrians from many origins walk in order to access (or leave) several destinations. The consented development (ie without selling QE Square, but with a new office tower, with a 50 metre EW laneway connecting QE Square to Lower Albert, and with a NS laneway connecting QE Square to Custom Street) will result in even more destinations. There will be 4,000 new office places in the new tower (accessed from the base of the tower - many coming by public transport - accessed from QE Square), a shiny new shopping centre (accessed from the EW landway - itself accessible from QE Square), at least one new cafe outlet - accessed from QE Square, and a major bus interchange in Lower Albert Street (accessible via the EW laneway). Is it an improvement if ALL of those pedestrian movements are squeezed and confined into a single 100 metre long EW laneway? I don't reckon so. It would be a retrograde step for pedestrian movement as it would eliminate comfortable and direct desire lines that presently exist across QE Square. Pedestrian amenity is about comfort and directness. That is what an open pedestrian mall public open space provides - as well as the opportunity to simply sit and pause and contemplate. A QE Lane is not the same as a QE Square. It would be a backward step for Auckland's downtown pedestrians. Submissions to the proposed National Policy Statement Urban Development Capacity were due ten days ago or so. It will - of course - be interesting to see what emerges, though the import of that policy initiative is somewhat dwarfed by the public debate that has developed (Grimes, Brash ANZ Bank CEO etc). Nevertheless, incremental changes will occur, and one hopes these might avoid chaos and catastrophic collapse which will ultimately affect people with little and low incomes far more than the wealthy and even the banks if we are to believe the commentary. It fell to my lot to do some detailed policy analysis of the proposed NPS. This took me into the 200 page Cost Benefit Analysis (CBA) of policy options prepared for MfE by a consortium of consultancies (including Covec, MR Cagney etc). This was a close typed and rather daunting document, which contained findings I'd like to share with you in this posting. The announcement of the proposed National Policy Statement on Urban Development Capacity was followed by two significant central government statements relating to urban development. The Prime Minister announced the availability of $1 billion to fund growth related infrastructure (this announcement has been further qualified by the Minister of Environment that this fund could be allocated to the Huapai area of North Auckland). The second statement suggested the establishment of a government run Urban Development Agency in Auckland, with the further suggestion that the agency might have the power to compulsorily purchase land that has been land-banked and is being with-held from development. ....there may be unintended consequences associated with the infrastructure planning, provision, and funding implications of objectives and policies in the NPS-UDC. These risks arise from the fact that infrastructure planning and RMA planning is governed by separate legislative frameworks, and also from the fact that some costs of providing and using infrastructure are not fully borne by users. “making land available for urban development without accompanying infrastructure is not likely to increase the supply of land and housing actually available for sale… such zoning does not increase effective supply, and is likely to have no impact on market dynamics… consequently infrastructure may need to be provided for land that has been zoned in excess of current demand”. “the infrastructure requirements and costs may… double… raising questions about over who will fund such infrastructure provision”. “that developers voluntarily ‘withhold’ new supply if other suppliers in nearby locations are also building”. I am surprised that these revelations survived the scrutiny that a government document like this must've been through. However at least this information is now public and from an extremely credible source. The primary mechanism that the NPS-UDC uses to try and bring zoned capacity in line with the need to "over-zone" to enable an efficient development market (ie one where competition can actually function) includes the 15-20% "sufficient buffer", but is primarily the requirement to assess physical and commercial feasibility of zoned capacity. A pure market economy approach appears to require "over- zoning", however over-supply of capacity is inevitably inefficient and wasteful. The NPS does not provide national guidance on policy to avoid land banking. Methods and powers need to be made available to local government to give it the confidence to release land that is supported with publicly funded infrastructure. Give us (and them) strength. The Environment Court hearing which examined the Auckland Council's statutory processes that would allow the divestment of Auckland's civic Queen Elizabeth Square and its transformation into high end retail shops fronting Lower Queen Street and the heritage CPO, teased out statements that merit publication. An outstanding example is the careful and detailed work of the Auckland CBD Residents Advisory Group Inc. The Court heard from its acting Chair - Tim Hannah - that the incorporated society has been in existence since 2004, that no fee is required for membership, has a board of 5, an active membership of around 30, and a circulation list for its newsletter of 500. 1. My earlier submission to the Court (volume 3, tab 47) aimed to convey a view of City Centre residents on the proposed Plan Change which envisages the sacrifice of Queen Elizabeth Square (QES), by its location a unique area of public space. 2. We took into account the expert evidence submitted by Auckland Council and Precinct Properties. Members of our Residents’ Advisory Group Executive Committee (RAG ExCo) have reviewed rebuttal evidence submitted since then. We remain very strongly supportive of the Auckland Architecture Association appeal against the Plan Change. 3. For the record the City Centre is the area falling within the urban motorway system and the harbour edge. Not just a business district but with high residential density –higher than Sydney or Melbourne. 4. Future expected residential growth is significant, by any measure. Within some 70m of this Court, 386 apartments will be completed in the next 18 months, mostly pre-sold for occupation. More families, more infants and children, more pets, more locals meeting up with out-of-town friends visiting the City Centre by rail or bus. A growing, liveable city needs every public space it has and more in Auckland’s case. Indeed this is the stated view of the Council -in its City Centre MasterPlan of 2012. 5. Until now, City Centre residents have not, we believe had proper opportunity to say whether we agree specifically with the sacrifice for all time of QES, a significant and reasonably substantial public space, located centrally at the City’s transport hub. Or if so, agree that only a modest part of the sale proceeds go in mitigation to waterfront development –of an area that much of is already in the public domain. Or agree that a substantial balance go to the CRL project, which should and is claimed to be, budgeted for in its own right, not paid for in this way. 6. Yes there was an on-line survey on current and future open-space provision downtown and consultation with the WLB and, with a selected focus, with iwi. But that specific question in all its significant elements has not been put. 7. But we do note a related public consultation -a survey in 2015 of local passers-by, as to their preferences for development of downtown public spaces. It is a sad irony that this highlighted hospitality and retail as lowest priority preferences. Yet this is precisely Precinct Properties’ proposed outcome of the sale of QES. 8. My earlier statement (paragraphs 4.11-14) canvassed a few different ideas that occurred to us, albeit amateurs, for redevelopment of QES both to rescue and enhance it and to recognise its scope to complement the new LQS project. 9. Council and Precinct Properties’ experts and officials’ rebuttal evidence very largely goes to some length to discount redevelopment of QES as at all worthwhile, almost even impossible. Rebuttal evidence especially target ideas for family-friendly facility type options which we advanced among others, civic or recreation-focussed. 10. It is a particular disappointment that Council officials now disavow the great emphasis they gave in the City Centre MasterPlan (2012) to “giving priority to children and young people…developing a strategic action plan that puts children and young people first”. Not more retail and hospitality outlets, one might footnote. 11. That Plan notes that “currently there is little to encourage parents to raise their children in the City centre or bring them to visit...more playgrounds and places for play will attract children and young people to visit and live in the city”. 12. So what about somewhere very central, relatively secure and congenial, often sheltered from the sun and not so exposed, removed from the hustle and bustle, where, for example, a parent who comes downtown or into town with a pushchair or young child could sit especially to await a friend or partner working in one of the many offices and entreprises in the city centre, or coming into it from elsewhere. QES fits this reasonable prescription extremely well. And offers other opportunities. Unlike LQS as proposed, the smaller area squeezed between major bus lanes and with busy east-west pedestrian flow. 13. At least in comparison with Mr McIndoe for Precinct Properties (vol.1 page 762 paragraph 4.11) who said earlier that the space was of “irretrievably poor quality”, Mr Falconer for the Council offered a glimmer of encouragement, however grudging: ”..an enhanced outcome for QES, even including a playground, will create at best some recreational value in a space set back from the hustle and bustle of LQS and apart from the nearby waterfront” (Vol. 1 page 503 paragraph 6.5). 14. To our regret he immediately reverts to support the Council waterfront development, which is of course unable to offer the same advantages, is simply not central, hardly adjacent, is across a busy road and moreover quite exposed. 15. Incidentally, Mr Johnston for Precinct Properties (page 762 in Vol.1 12.2) tells us that he does not consider the heart of the city as an appropriate place for “tranquillity, contemplation or isolation”. This is most distressing quite dystopian advice to thousands of our residents. Fortunately quite out of sync with Council’s aspiration for a ‘liveable’ city centre. I’m sure like me, many here have valued spaces in hearts of cities elsewhere where one can just sit and contemplate life passing by, in relative tranquillity and isolation, aside from the hustle and bustle. We hope the Court may ignore Mr Johnston’s view. Even perhaps that Precinct Properties may not support it. 16. Turning to the proposed waterfront development, Your Honour and Commissioners, the RAG Executive Committee has not taken a position against this. On the other hand, we do not quite share the self-gratifying feeling of shock and awe echoing round Council chambers at this alternative they are offering. 17. For Mr Falconer (vol.1 page 503 paragraph 6.5), QES doesn’t stack up against the “pleasures of viewing the wider harbour, observing the movement of watercraft, promenading, dining and recreating (sic) in the sunny environment of the waterfront”. Well, you can effectively do all that now; the new development will scarcely lift a veil on the wider harbour and not everyone wants to be out in the sun anyway. Then Mr Vinall, also for the Council, also disparages QES and its possibilities, mostly because he ‘doesn’t interpret’ it as fitting the old District Plan definition of a ”premier civic space” (vol.1 page 577 paragraphs 6.2-6.3). Plan provisions have now apparently become decisive. 18. But to move on, as noted we do not dismiss the Council’s proposed harbour development as such, just the sacrifice of QES to enable it to proceed. It’s not even a good partial trade-off, in our view. We are also sceptical –at least, about related aspects of the overall transaction. Our reservations were discussed in my initial statement, paragraphs 4.15-18. 19. To sum up, the Group recognises that its lay contribution stands in some isolation from others, from the many experts and officials involved in this hearing. But there are of course differences between them. We have sought to point to discontinuities and considerations relevant to city centre residents’ concerns, those specifically of the neighbours to QES. The Auckland Architecture Association speaks well for these. 20. We are strongly convinced of the civic and public amenity value to be secured for CC residents by the Square’s retention and redevelopment both in its own right and to complement and add value to the adjacent linear Lower Queen St public space. We believe our views may resonate with many of the non-locals who will visit or pass through this special central point in Auckland. 21. Your Honour and Commissioners, the Group’s decision to join this appeal as an S274 party was not taken lightly. Quite the contrary. Much debated among Executive Committee and some other members whether we should, indeed could, do so. Involvement has been a considerable challenge. But development and maintenance of public space has been a continuing priority focus by the Group since its inception in 2006. We ask that a city centre residents’ perspective can be given some weight in your deliberations, please. c/ The Secretary, CBD Residents’ Advisory Group Inc. This posting contains a few highlights from the 5 day hearing. In fact, the court hearing is not quite over, after 5 days and over 2000 pages of evidence and annexures. On Wednesday next week the court will hear the closing submissions for Auckland Council, Auckland Transport and Precinct Properties - these apparently deal with new matters that have arisen during the hearing. One of arose from questions from Judge Newhook about the kinds of conditions or requirements the Court might be able to impose relating to the certainty (budget and delivery for example) of the proposed waterfront spaces that have been offered in exchange for QE Square - should it be sold. In effect the Court is seeking - perhaps case law or other authorities - guiding potential decision-making - so the Court can have some authority over the Council and AT - in regard to decisions that are based on Council resolutions, and on which the future of proposed waterfront public spaces at Queens Wharf and across Quay Street from PWC building depend. That will be interesting. And because there may be new materials introduced in those submissions, Counsel for Auckland Architectural Association Inc and Urban Auckland Inc have been offered the opportunity to reply to those on the Monday following. Which will bring this comprehensive and engrossing hearing to an end. The court has indicated it will aim to produce its decision 3 or 4 weeks after that. Can Auckland reply on Council decisions? As mentioned above, this question kept coming up from the bench. Right from day 1 Judge Newhook raised questions about the certainty of funding for proosed waterfront spaces. He wanted to know how the court might enforce those commitments, because it's finished when it's made its decisions. Counsel for AT and Council suggested that perhaps the court might impose conditions regarding timing. I'd say, given my experience of the relationship between RMA and LAG, good luck with that. As commissioner hearing council consent applications for emergency wastewater discharges under the RMA, we were endlessly advised we were unable to do anything or decide anything that required new Council spending that had not been through the LGA and Annual Plan public processes of consultataion and decision. But you never know these days. These are strange times. When can Plan Change rules be changed later by non-notified consent? This was an extraordinary discovery for me. Commissioner Dunlop asked questions throughout the hearing about whether it was possible for the rules in the plan change (that relate to building height, east west laneway width etc) to be changed later simply though an RDA - a restricted discretionary consent. This was a new area for me. I'd always thought we were dealing with a plan change - one that changed the zoning over QE Square from public open space to another that allowed commercial development - both zonings already sitting in the District Plan. But it isn't as simple as that. What we were dealing with here is a Plan Modification (Plan Modification 79 - PM79), rather than a Plan Change. So while one thrust of the modification was to change the zoning, the other thrust was to impose some specific rules. One focus of the rules is the East West laneway that connects Lower Albert Street bus interchange (and the downtown shopping centre) to Lower Queen Street. This laneway is to be on privately owned land, but over which there is a contractual agreement with Auckland Council and AT (costing $2.5 million) whereby Precinct provides 7/24 public access. Not the same as an easement - but similar in effect. So in PM79 there are rules relating to this lane. Commissioner Dunlop was aware that these rules are development controls, and - as such, can be changed by means of a subsequent resource consent application. He wanted know, for example, could Precinct decide not to build a lane at all, and support that with an RDA, and of so, would that consent application need to be notified. These matters had not come up before. I think the old Auckland City Council approach to CBD development control rules and similar approaches has been at the heart of how consents to build 40 storey towers can be handled without any public notification. The approach still exists in the operative district plan. There was ome discussion in the court of the Proposed Auckland Unitary Plan provisions for the CBD, but it wasn't at the heart of this hearing. I have to say I found it very disturbing that public infrastructure - like an east west laneway, and other public interest matters - like the height control for the proposed retail development fronting Lower Queen Street, are essentially controlled by rules that can be changed by a subsequent resource consent application. They are rules that do not have the same certainty as those that are in District Plan zonings. Counsel for Precinct was at pains to convince the court that any such subsequent resource consent application would have to be publicly notified. But I'd observe the track record of public notification, and the scant regard for public interest matters (such as open space) evidenced by Auckland Council behaviour, suggest otherwise. How good are the proposed alternative waterfront spaces? Questioning from Judge Newhook in particular focussed attention on the funding, delivery and purpose of the proposed waterfront spaces. There are 3 on the table. One across Quay Street from the Price Waterhouse Cooper building (a new space consisting of a platform over the seabed), one broadly in front of the Ferry building (another new platform built out over the seabed), and the Queens Wharf breastworks between Queens Wharf and Captain Cook Wharf (wharf and Quay street edge infrastructure owned and used by Ports of Auckland Ltd). The court largely focussed on the first two. (Listening between the lines you'd have to say that POAL isn't going to let any of its space go anytime soon. One of the deals it was keen on was to be permitted Bledisloe extensions in exchange for Captain Cook and breastworks. While the future of the port hangs in the balance there is little chance of public space being released). A couple of issues emerged from the discussions about the new space discussions. First, the proposed platforms would require consent. Not so easy in Auckland CBD to get consent to effectively take waterspace. Second, the priority for Council is the repair of the whole seawall that holds reclaimed land in, and the sea out. This seawall is at risk of collapse (seismic or other forces) and needs repair and strenghthening. That is the focus of the budgets that were presented to Court. It appears that work would be done by Council. Work on possible platforms would be done by Auckland Transport it appears - primarily because those platforms form part of proposals to re-arrange wharf and berthage infrastructure for ferries. (You can see that this hearing strayed into all sorts of inter-connecting areas - that was inevitable). Questions were asked about the need to provide for ticketing, where passengers might wait and suchlike. Also about what was to happen with the Waiheke wharf (to be demolished). None of these projects are easy. It is hard to escape the oberservation that the proposed public open space is little more than an expanded ferry terminal constructed on a repaired seawall. We all love waterfront spaces but they are different from CBD public spaces and perform different functions. As Commissioner Kernohan observed, you're not replacing like with like. There were many key moments in a hearing like this, which was conducted with a great deal of decorum and where everybody and (I think) all relevant issues got a good airing and hearing. And maybe I'll write about more of them another time. David Gibbs (Architect and CEO of the Construkt Architectural firm) is one of AAA's expert witnesses. During his cross examination he became engaged in a rather delightful exchange with Commissioner Kernohan who is himself an architect. They traversed the original Professor Kennedy Plan for the waterfront, and its emphasis on providing an East West access fronting the CPO (Britomart railway station building). The discussion included the windtree sculpture which was commissioned for the combined QE Square and Lower Queen Street space - and how it was vandalised and later relocated to Wynard Quarter (where it continues to be vandalised). It was a delightful architectural discussion. Gibbs said that because Queen Square (we used Queen Square as a descriptor to include the combination of QE Square and Lower Queen Street spaces) was enclosed it has great potential as a civic square. Then Kernohan asked a final question. The court transcript will reveal it. But I will remember David's reply for a long time. Queen Elizabeth Square is the Yin to the Yang of Lower Queen Street. An update on the hearing of the Environment Court appeal brought by Auckland Architectural Association and friends into the statutory processes for the sale of Queen Elizabeth Square. It reflects on 3 days - but not of peace, love and music! Auckland Council and Precinct Properties have really thrown the book at this. As witnesses take the stand to be cross examined, Counsel ask them to take one of several full lever arch binders, turn to a tab, and refer to a page number. I think the highest page number so far is 1,900 and something. The hearing started with the gentle but insistent tones of Paddy McNamara acting for Auckland Council and Auckland Transport. His focus was to set out the functions of Queen Elizabeth Square (just the section up for sale) and to argue that these functions could be better provided elsewhere - notably on the proposed waterfront spaces. Appropriately he also allocated time to exploring the Road Stop and Plan Change. He concentrated on criticising Queen Elizabeth Square by itself rather than considering it PLUS Lower Queen Street spaces combined. Judge Newhook was immediately interested in the certainty of funding for the proposed alternative waterfront spaces, noting that Council resolutions can readily be overturned. Tim Watts formally head of Auckland Council's built environment team was up after lunch. As author of many of the reports and council agenda papers he has been central to the process for the past few years. Commissioner Kernohan jumped in here questioning whether this would be a like-for-like process. Kernohan suggested QE Square was a civic place, central, and relating to the CPO building. He suggested that you can't replace one with the other. One of the interesting points that came out of the cross examination was when McNamara asked Tim Watts to read from sections of the Urban Reset report that was prepared for Auckland Council in 2014 by Garth Falconer. He read from its account of pedestrian movements. This was new information to me. Interestingly, Auckland Council experts generally argue that the desire line for pedestrians is North South along Lower Queen Street, and that hardly anyone ventures into QE Square at all. However, the forgotten page 13 in the 2014 Urban Reset report indicates that East/West ped movements across QE Square are in the same range (11,000 - 15,000/day) as those North/South along the west edge of Lower Queen Street. This fact flatly contradicts the popular myth that QE Square is rarely used. Observations suggest there are peak am and pm movements North/South as people commute to and from work, while the East West movements are steady throughout the day. Many mix and mingle on the way. Take a pause. Or sit and chill. Eat a sandwich. 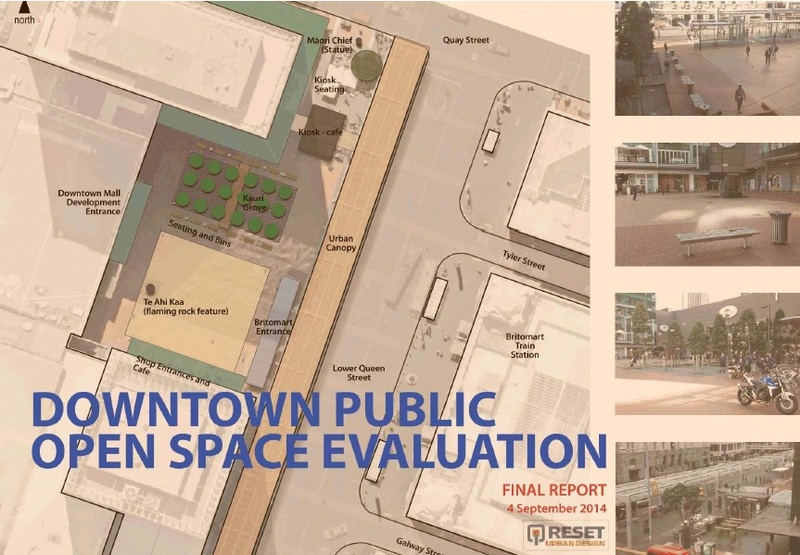 Also of interest, the Urban Reset report contains the Colliers door count data for people entering the downtown shopping centre off QE Square. The figure reported is 4,125/day on average (2013). Clearly Colliers are mainly interested in how many people actually ENTER the downtown shopping centre (DSC). But of course they have to leave as well. The evidence in front of the court includes Collier door entry counts for the 3 doors. Entry figures are about the same for all three - with more entering from Custom Street. 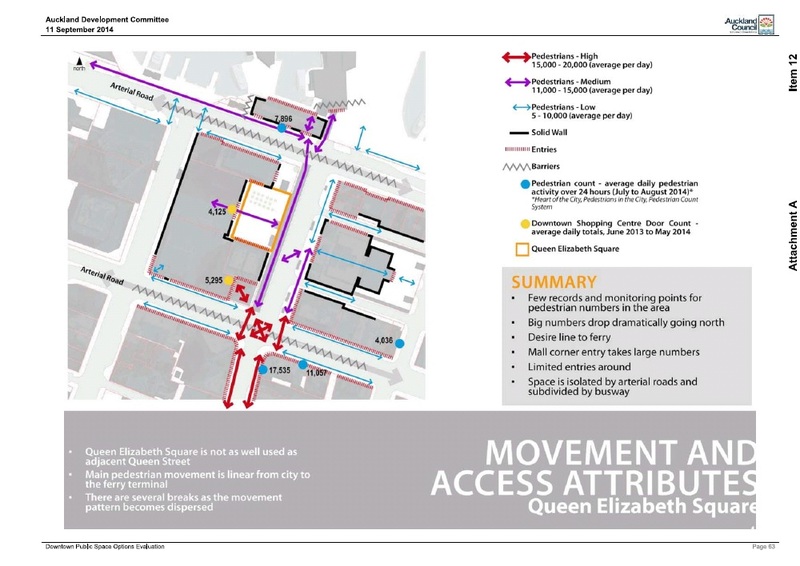 It appears that the combined entry and exit ped movements in and out of the DSC from and into QE Square account for most of the 11,000 (minimum) total ped movements across QE Square/day that are reported in the Urban Reset study. (Pedestrian counts measure movements in BOTH directions - coming and going). and a new office tower that will accommodate thousands of new office workers - most of whom will arrive by public transport for work. All this indicates that QE Square will be a thriving pedestrian mall. But Council evidence appears to ignore that in its campaign to discredit and demean this highly used civic pedestrian mall area. Day 2 was another busy day. Highlights including more evidence about the proposed waterfront spaces, what they are for, who will fund them (Council or AT), whether they are consented or not (not) and how likely they are to be delivered. More on that another day. It seemed to me that the proposed spaces - to be built by Auckland Transport - would be there to support expanded ferry services and new berthage. All necessary - but hardly compensation for downtown public space. More on Day 2 another day. There is a need to provide a major, high quality civic space in the downtown area that can accommodate a wide variety of public uses. To be an Auckland-wide facility, and to be memorable in the minds of most Aucklanders, it needs the scale, enclosure and shape of a major square. Queen Square provides the opportunity to re-create such a space. It has the size, the location, the heritage buildings as framing elements and a major new development along its western to enable its development as a great public space for our city. I foresee a future urban square in front of the Britomart Transport Centre that accommodates a wide variety of public activities in various areas within its perimeter, where these different areas are demarcated by excellent paving, planting and furniture design such as we have seen elsewhere in the city in the last decade, with hugely active frontages around Zurich House and the new downtown development, and where the south face of the HSBC building becomes a positive attractor – a giant light show incorporating advertising and art perhaps. You'd think that a city aspiring to be the most liveable would view this sort of idea as worthwhile and worth delivering for its citizens. Well. Selling public open space doesn't suggest Council has much enthusiasm with that idea. More on that another day. The hearing has been extremely valuable and valued. Your continuing support is much appreciated.